Create powerful inspection templates, carry out thorough audits quickly, whilst capturing as much data as possible. 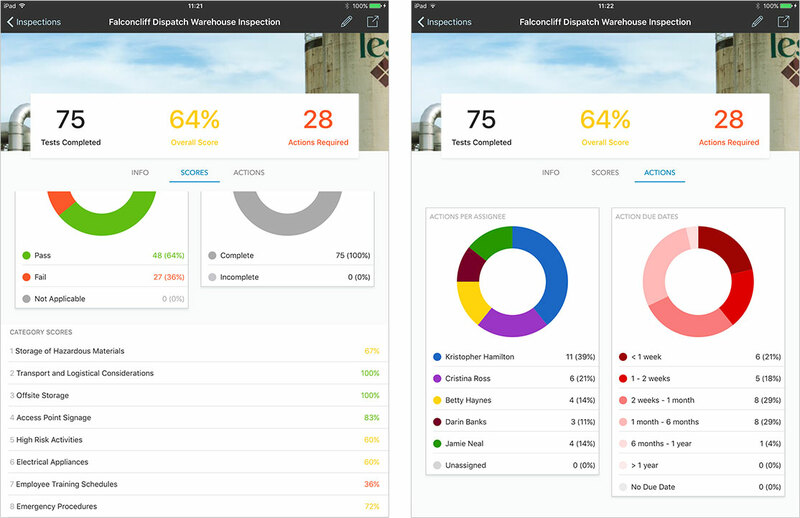 Manage your inspections all in one place. 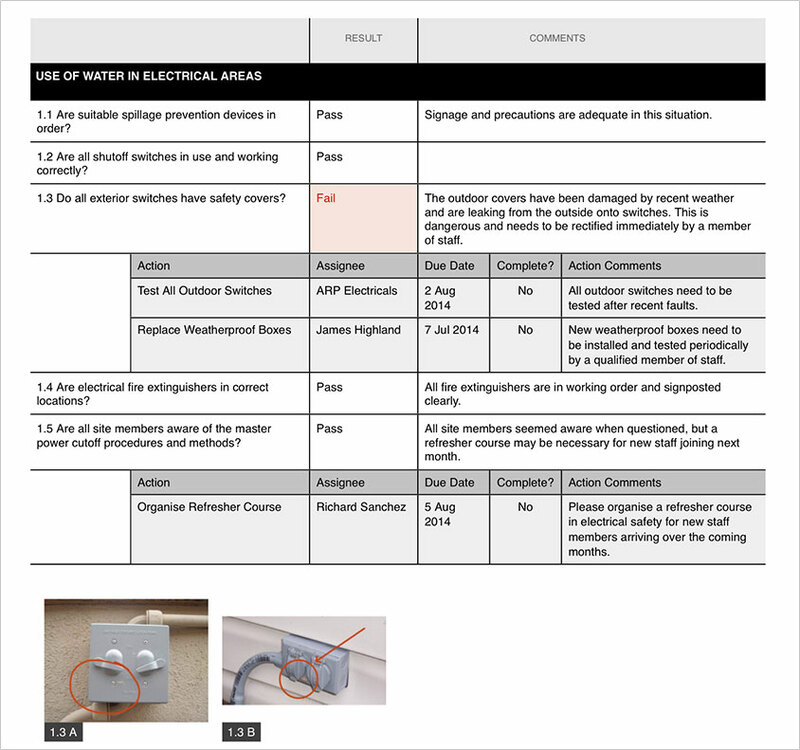 Create your personalised inspection templates, then use these to perform detailed audits. With the option to add comments, photos and required actions to each inspection test, Checklist Inspector is the most powerful auditing software available. 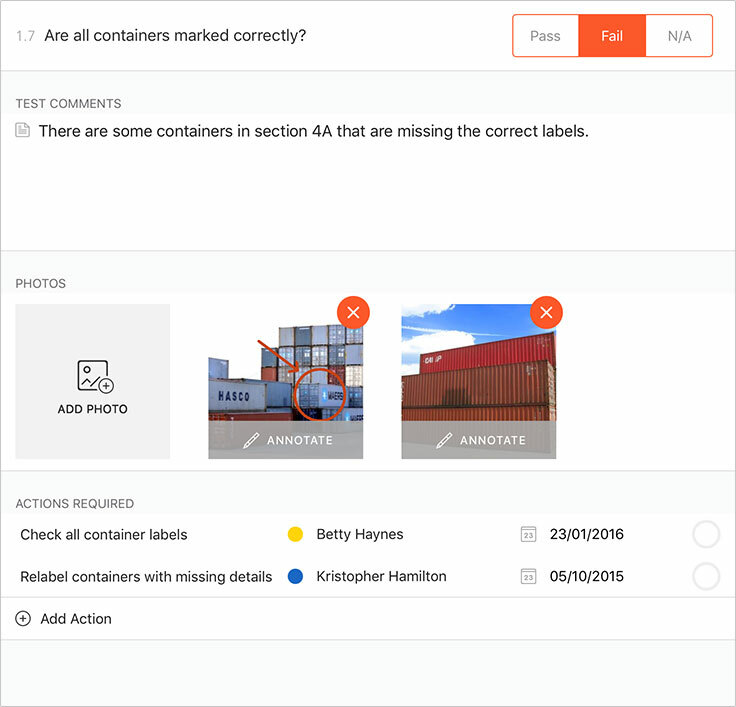 Comments, multiple photos and assignable actions can all be attached to individual inspection tests, making it easy for you to organise all of your findings to boost the power of your inspections. 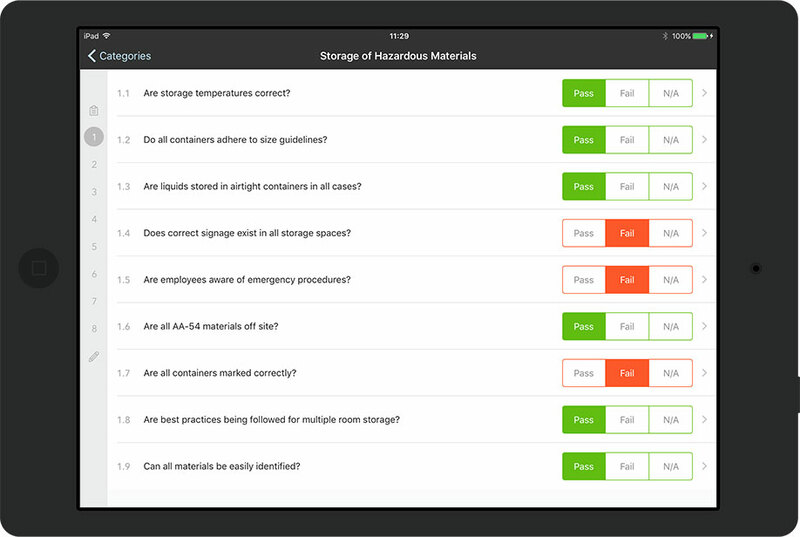 Checklist Inspector automatically displays useful data from your inspections, giving you a full understanding of the inspection at a glance. With Checklist Inspector, it’s simple and easy to stay informed about all your inspection work. Only need to provide one contractor with their relevant inspection findings? Checklist Inspector is set up to handle that, just select that contractor in the report options. 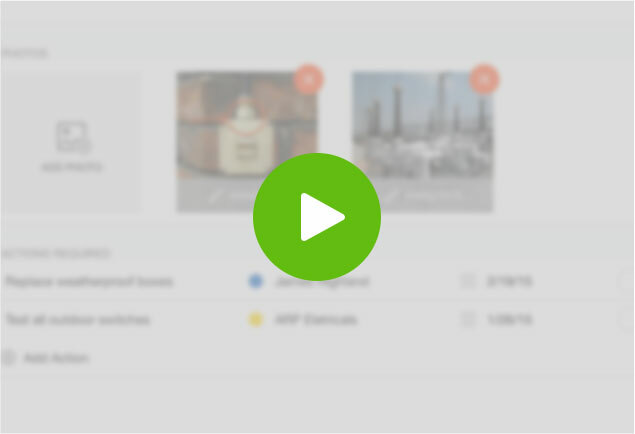 You can also personalise your reports to include certain dates, or only actionable issues. Flexibility is key to Checklist Inspectors power. Build inspection templates that are perfect for your work, no need for any uneccessary questions or tests. Build your inspection templates in app, or use our free online Template Builder to build templates on your computer, great for migrating existing inspection data quickly from documents and spreadsheets. 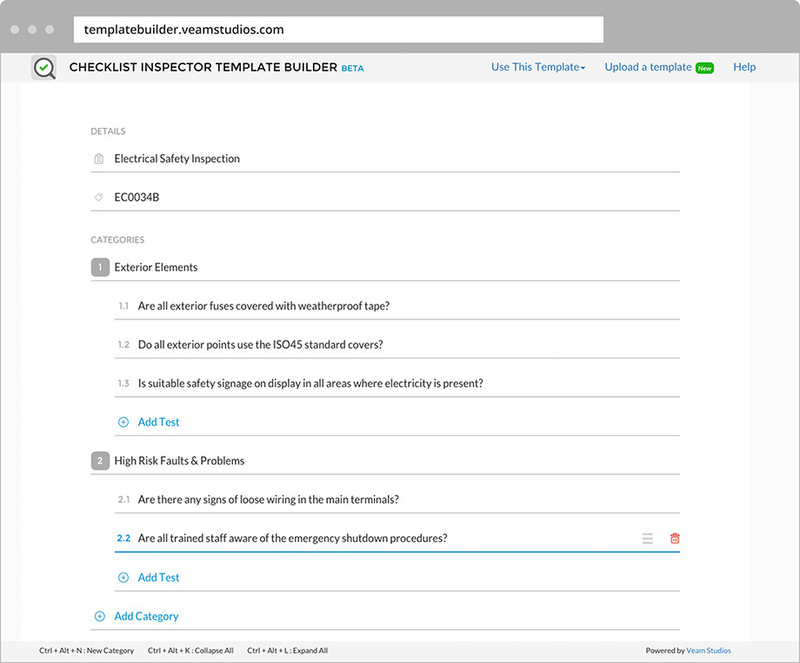 Checklist Inspector allows you to set up inspections exactly to your specifications. 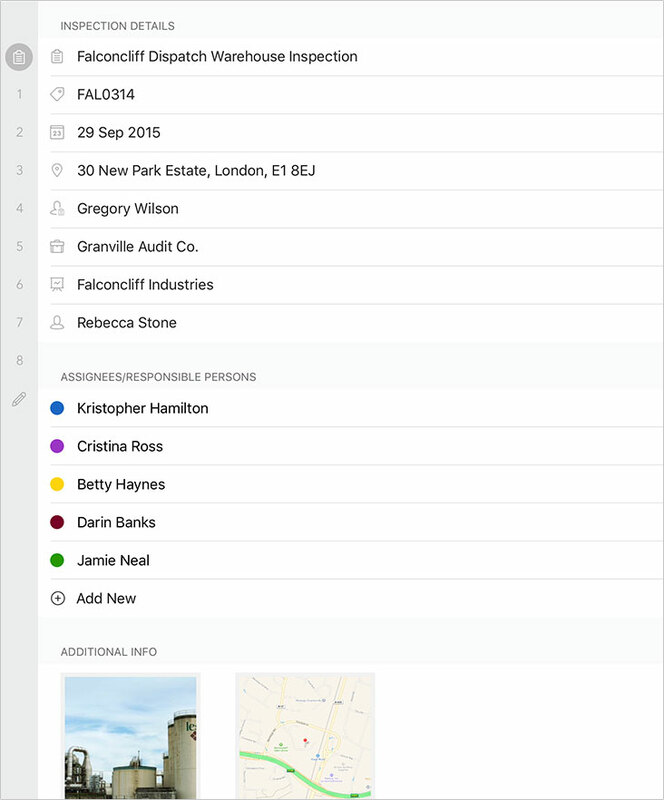 Add location, map, site photo, client details, up to 10 assignees/responsible persons and more. Checklist Inspector ensures you maintain the highest level of precision. Check out how Checklist Inspector works in the video below, demonstrating the ease of setting up a template, then using this for an inspection. We love hearing how our customers are using Checklist Inspector to get things done, check out some of our reviews below from the App Store. Exactly what I needed to carry out necessary annual reviews needed to keep on top of any issues discovered during these visits. Fit for purpose. This app is very user friendly and east to customize for my needs. The ability to export the final report to a PDF doc and email is wonderful. I saved 45 minutes on first audit with the ease operation from my iPad, this is huge for me. Great app and well worth the $15.00. Very useful, user friendly, simplified and customisable inspection app. For regular or routine checks and inspections, I have seen nothing that beats it, certainly not on cost. The development team proved really responsive too, quickly resolving early, first version, template difficulties. You design the questions and the flow, capturing the information that matters to you, along with the actions needed to put it right. So much faster than a clipboard, email the outcome of the inspection seconds after finishing, no wasting time writing a report on return to the office. We have used this for a while now, it is a winner, highly recommended. Veam Studios Ltd (“us”, “we”, or “our”) operates http://www.veamstudios.com and its App counterparts (the “Service”). This page informs you of our policies regarding the collection, use and disclosure of Personal Information we receive from users of the Service. While using our Service, we may ask you to provide us with certain personally identifiable information that can be used to contact or identify you. Personally identifiable information may include, but is not limited to, your name, email address, company name, postal address and phone number (“Personal Information”). We do not collect or store any credit card or banking details for using the Service. Like many site operators, we collect information that your browser or App sends whenever you use our Service (“Log Data”). This Log Data may include information such as your computer’s Internet Protocol (“IP”) address, browser type, browser version, the pages of our Service that you visit, the time and date of your visit, the time spent on those pages and other statistics. Cookies are files with small amounts of data, which may include an anonymous unique identifier. Cookies are sent to your browser from a web site and stored on your computer’s hard drive. Like many sites, we use “cookies” to collect information. You can instruct your browser to refuse all cookies or to indicate when a cookie is being sent. However, if you do not accept cookies, you may not be able to use some portions of our Service. The following terms of service and end user license agreement (“EULA”) represent an agreement between you and Veam Studios Limited. This EULA governs your use of Software and Services. For purposes of this EULA “Software” means all software made available by Veam Studios Ltd including, but not limited to auditing applications, downloadable/installable apps for personal use. Software also includes updates and upgrades as well as accompanying manual(s), packaging and other written, files, electronic or online materials or documentation, and any and all copies of such software and its materials. If you are using the services on behalf of an organization, you are agreeing to these terms for that organization and are warranting that you have the authority to bind that organization to these terms. In that case “you” and “your” will refer to that organization. Veam Studios is solely responsible for providing any maintenance and support services with respect to the Licensed Application, as specified in the EULA, or as required under applicable law. Apple has no obligation whatsoever to furnish any maintenance and support services with respect to the Licensed Application. Unless specified to the contrary, Veam Studios Ltd owns the source code to all applications developed by Veam Studios. On any occasion where Veam Studios Ltd suspects the app has been provided to a third party, Veam Studios Ltd has the right to begin legal proceedings. Both Veam Studios Ltd and the end-user must acknowledge and agree that Apple, and Apple’s subsidiaries, are third party beneficiaries of the EULA, and that, upon the end-user’s acceptance of the terms and conditions of the EULA, Apple will have the right (and will be deemed to have accepted the right) to enforce the EULA against the end-user as a third party beneficiary thereof. Our Services and Products may, from time to time, require updating. Veam Studios are contractually bound to resolve any bug issues, and ensure the latest version of our Products and Software are available through the relevant channels. We hereby reserve all rights not expressly granted in these Terms. You must not reverse engineer or de-compile the Software, nor attempt to do so, nor assist anyone else to do so. Our Services will request permission to update on your device when a new version is available. Your acceptance of such updates is required under each device. Any end-user questions, complaints or claims with respect to the Licensed Application should be directed to the above contact channels. Download brand & product logos, as well as app screenshot packs. Please contact us at press@veamstudios.com if there is anything else we can provide, thanks.